Subaru’s new Forester, due to arrive in March this year, has been awarded a five-star safety rating by Euro NCAP. Thanks to advanced safety systems, cutting-edge chassis design and high-tech safety assistance systems, the all-new Forester is the safest Forester ever built. The Euro NCAP rating follows a five-star Australian ANCAP safety rating which the new Forester also scored earlier in 2012. Since 2009, a more comprehensive and rigorous assessment system has been implemented at Euro NCAP, which evaluates Adult Occupant Protection, Child Occupant Protection, Pedestrian Protection and Safety Assist. Scoring well in all areas, the new Forester was awarded the maximum-possible score for the protection of all body areas in a side barrier test, while its front bumper scored top marks for pedestrian leg protection. The fact that the new Forester features better visibility – thanks to the A-pillar sitting some 200 mm further forward than before – and all-round raised seating positions, also enhances its crash safety performance while providing better all-round visibility for a safer drive. The new Forester is loaded with safety technology which not only serves to keep its occupants safe but also reduce the risk to other road users. Standard safety systems include ABS with EBD and VDC (Vehicle Dynamics Control), which monitors all four wheels and ensures the Forester remains stable at all times. Complimenting these systems are seven airbags (including a driver’s knee airbag) and a collapsible brake pedal and steering column which go further to minimise injury upon impact. The new Subaru Forester also provides five three-point inertia reel seat belts for all occupants (pre-tensioned at the front) along with ISOFIX child seat mounting points with tether anchors. Adding extra safety is the new reversing camera, which links to the multi-function display screen to provide a clear view behind the new Forester. 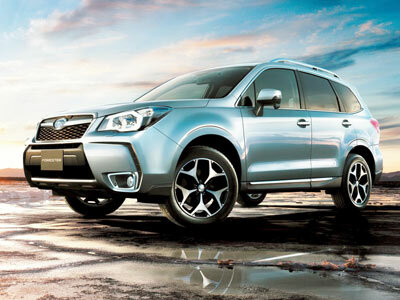 This entry was posted in News and tagged 2013, Forester, South Africa, Subaru, SUV. Bookmark the permalink.